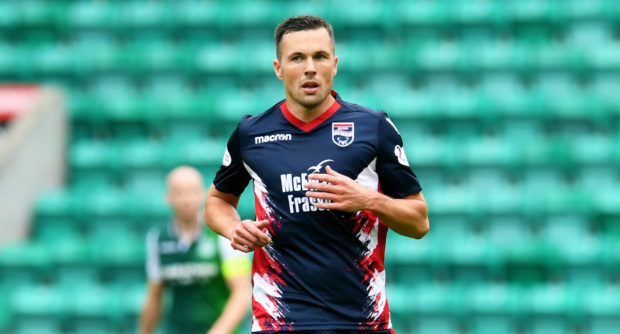 Ross County midfielder Don Cowie has hailed the Staggies for holding their nerve as the Championship’s pacesetters. County stand on the verge of securing an instant return to the top-flight following their relegation last season, with Partick Thistle today’s visitors to Victoria Park. Despite pressure from second placed Dundee United in recent weeks, the Staggies’ fine run of eight wins from their last 11 league matches has kept Stuart Kettlewell and Steven Ferguson’s men in pole position, and veteran midfielder Cowie feels they have done well to take the pressure in their stride. The 36-year-old said: “It has been a tough period, a lot of games and not much rest. “It has been well documented we have had a lot of injuries. It has just been a case of trying to get together and show character. “We would liked to have played better recently, but all that matters is getting results and that’s what we have been able to do. “When you are up at the top you are there to be shot at. People have their opinions on us, but we have never swayed from that – we have stayed focused. “We knew what our goal was at the start of the season and that has not changed throughout. “There have been ups and downs along the way but we have showed character. “Whether it’s losing a game and bouncing back, or not playing well in a half and then doing well and responding in the second half. Partick arrive in Dingwall equally desperate for points to claw themselves out of the danger zone, having slipped two points below Alloa Athletic into the relegation play-off position. Former Scotland international Cowie added: “It’s tough for them because Alloa have managed to win three on the bounce and it has just changed the whole dynamics at the bottom. “Falkirk and Partick looked like they had really strengthened in January and were starting to turn the results around. “Unfortunately for them everyone else is picking up points as well. “There’s an awful lot to play for between now and the end of the season. I’m sure there will be twists and turns along the way as they all have to play each other. Cowie played under Jags boss Gary Caldwell at Wigan Athletic, and he reckons his former manager will be striving to prevent a second successive relegation for the Firhill outfit. Cowie, who also played for Watford and Cardiff City, added: “He just loves football – he lives for it. Even as a player you could see he was destined to be a manager. “He’s always wanting to find new things out about football.